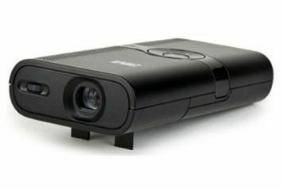 CES 2010: Optoma unveils ultra-compact DLP Pico projectors | What Hi-Fi? It's the $299 PK 201, with LED lamp, 16:9 resolution and can deliver an image from 5in to 66in. The device measures 0.7in x 2.4 x 4.6in (hxwxd) and has a built-in 0.5W speaker, Micro SD support up to 16GB and a rechargeable battery. Connectivity includes a mini HDMI in, composite video, VGA and micro USB inputs, plus an audio output. Joining it in Optoma's Pico family is the $399 PK 301 designed for use with netbooks. The PK 201 is due on sale in the US during the first quarter of this year, the PK 301 in the second quarter. You can see the Optoma PK 201 in action in our CES video round-up.